I’m just warning you. I love onions. So from now until September, you are going to see onions popping up all over this blog. But perhaps not in ways you might expect. 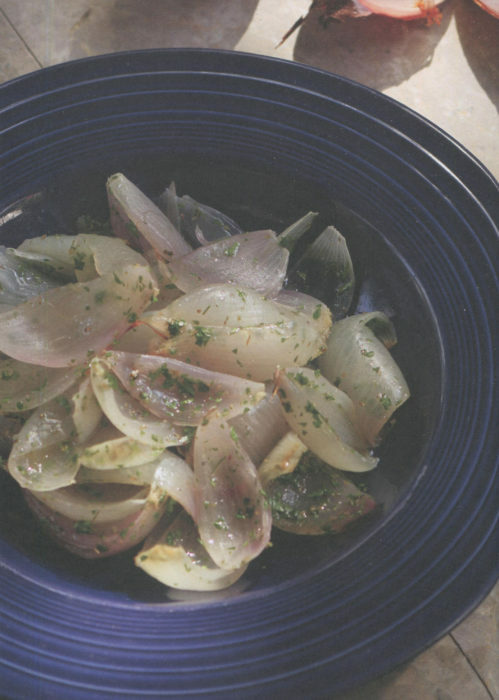 In her new cookbook My Greek Table, Diane Kochilas offers this simple, stunning presentation of onions. Creating this dish is amazingly easy. Roast onions for an hour plus, take them out, peel them apart, and dress with olive oil, vinegar, garlic, parsley and — what else — Greek oregano. Pair up with chicken, or lamb, or [yes] goat, and you’ll have a true Greek feast. I suppose you could splash some pine nuts on, too. Place the onions in a shallow baking pan and roast for 1 to 1 ½ hours, until soft and lightly charred. Remove from the oven and let cool. Peel the onions and break them apart or cut into wedges. Place in a serving bowl. Whisk together the olive oil (use more or less to your liking), vinegar, garlic, oregano, and parsley in a small bowl. Season to taste with salt and pepper and drizzle over the onions. Toss to combine and serve.